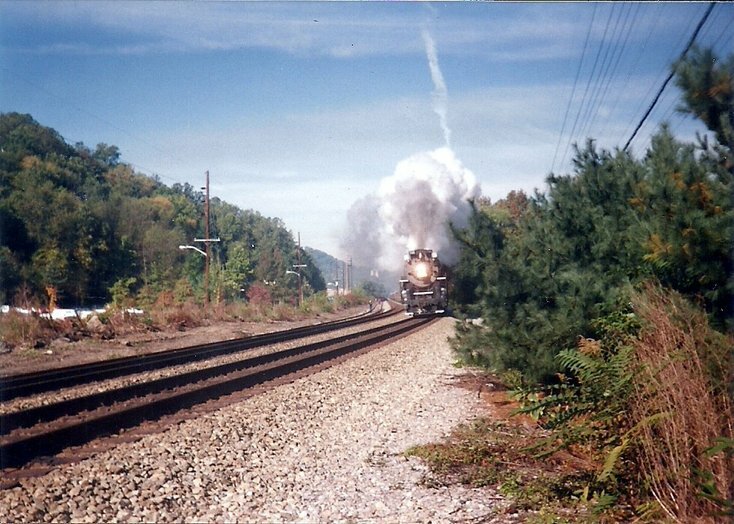 October was once a charismatic month along the C&O main line between Huntington and Hinton with the running of the annual New River Trains. Scheduled for two consecutive weekends, an interested party had four days of which to choose a beautiful fall excursion through the scenic New River Gorge. 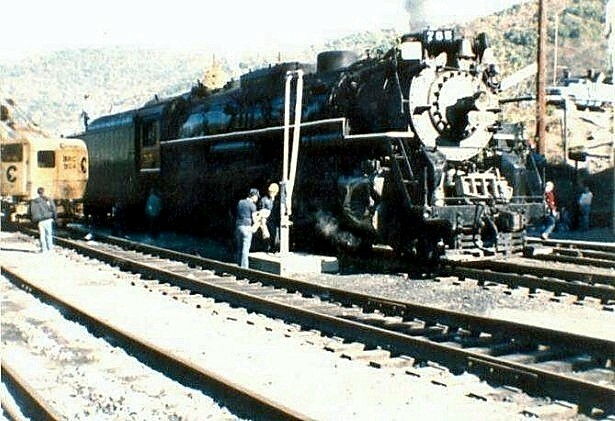 Even if one did not elect to ride the excursions, there were four days that could be spent trackside watching the passing of this spectacular train. 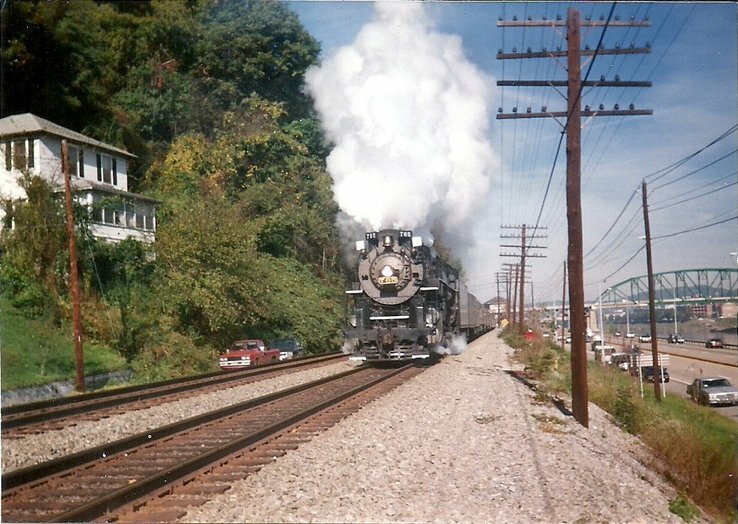 Steam power was the preferred first choice for the events when it was available. If it was not, attempts were made to at least secure classic diesel power to pull the trains. The trains were long and consisted of private cars from numerous fallen flag railroads---a potpourri of colors and car types but impressive nonetheless. It was a far cry from the more homogenized Amtrak version that has been used for the past two decades. 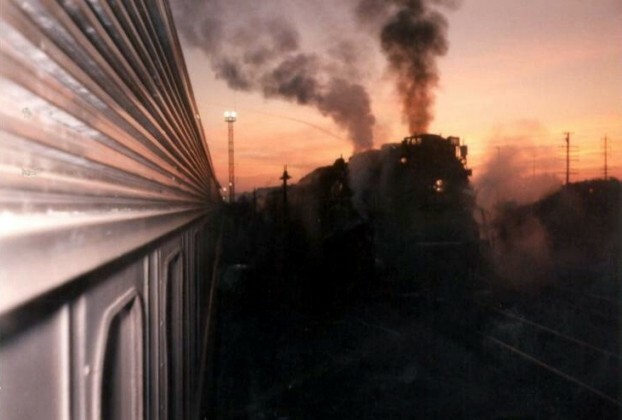 Reflecting on the rail excursions during that era, probably a third of the passengers were die hard rail or steam enthusiasts. They enjoyed the trip because of the train and locomotive and were fascinated by the excursion from primarily a railroad perspective. Listening to the #765 blow its whistle at the numerous grade crossings, the cadence of its exhaust, and the smell of burnt coal in the crisp autumn air harkened with nostalgia or perhaps introducing the experience for the very first time. 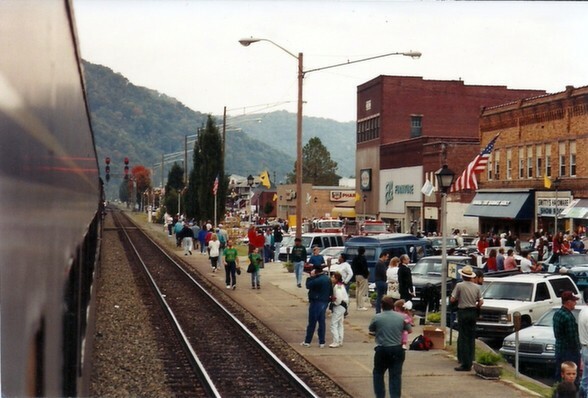 Others simply looked upon it as an opportunity for a unique trip through the scenic upper Kanawha and New River valleys amidst the vivid fall foliage and to visit the Hinton festivals that took place in conjunction with the New River Trains. Every excursion trip I ever took, the majority of the time was spent standing in a vestibule. Once my legs grew tired from standing for long periods of time, the seat would beckon but for only brief periods of time. I would again return to the vestibule for the next round. Occasionally my dad would stay out there with me for a stint and in later years, my wife. Both enjoyed the sights passing by and the smell of burnt coal but probably not to the extent that I did. Although the family did not see much of me on the train, there was more unity at Hinton as we stayed together walking through the town. It would be appropriate to include here that these were cherished family outings and the passing of the years has elevated the fondness of these memories especially now since mom and dad are no longer with us. If I have any regrets from this era it would be the number of photos I did not take. Looking back, I spent more time enjoying the rides rather than burning up the shutter. A better quality camera is also a hindsight wish but I am grateful for what is on this page and to share here almost thirty years later. 1991 witnessed a #765 powered excursion that was a scenically marked contrast to a ride through the New River Gorge. The Collis P. Huntington Historical Society sponsored a Labor Day Excursion to Cincinnati that year with a layover in the Queen City to watch a Reds game. 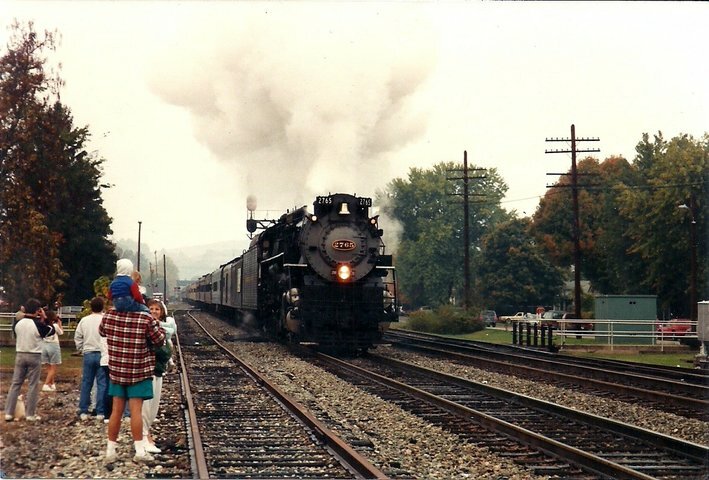 After the game ended, the excursion returned to Huntington before terminating at Saint Albans. Of note, the Charleston station was not utilized that year because the owner of the building denied the use of its facilities. The exact circumstances of why not I am not certain. In any event and despite its duration, the trip was an enjoyable excursion along the Ohio River on the Kentucky side. The return trip is what I specifically remember. The baseball game lasted longer than anticipated and over the road delays caused the train to arrive in Saint Albans past midnight. The engineer opened the throttle on the #765 east of Huntington and I thought for certain the train would come off the track at Scary Creek curve just west of Saint Albans. 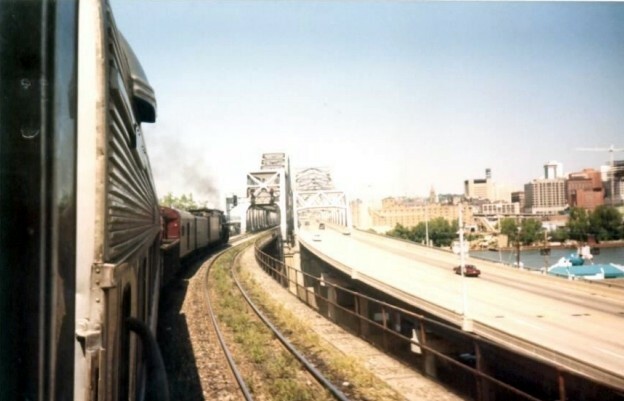 Two years later in 1993 marked the final appearance to date of the #765 on the New River Train and on CSX rails altogether. 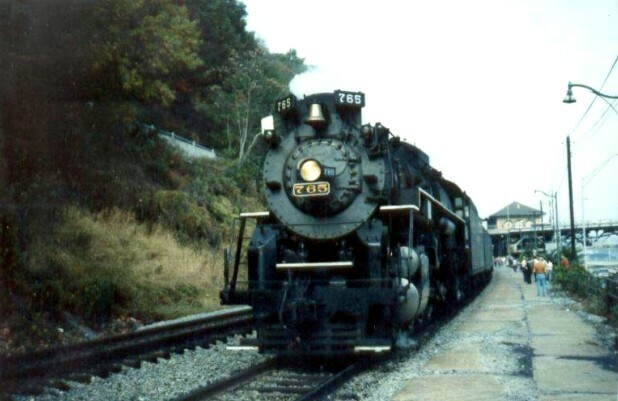 To commemorate the heritage of the run, the #765 was repainted into a C&O Kanawha---the name the road chose for this class of locomotive instead of Berkshire--- and renumbered as the #2765 which was correct for the occasion. 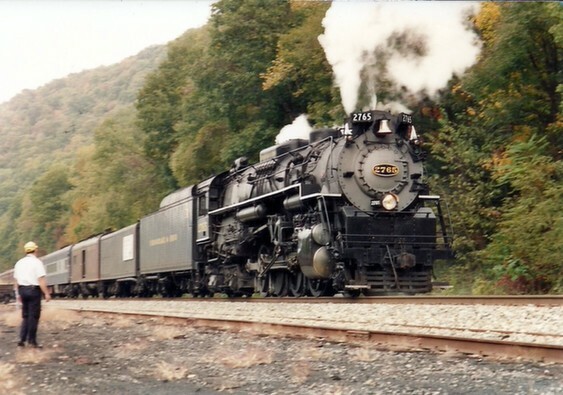 1993 also ended the first excursion career of the #765 and it was mothballed needing an overhaul. It would be thirteen years before it returned to mainline excursion service again. 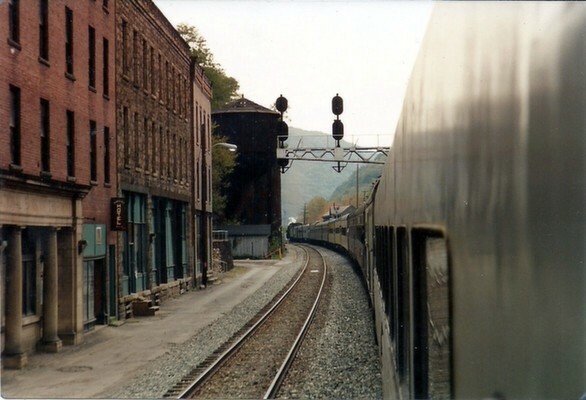 Just as in 1991, the Charleston station was not used and the family and I boarded the train at St. Albans. 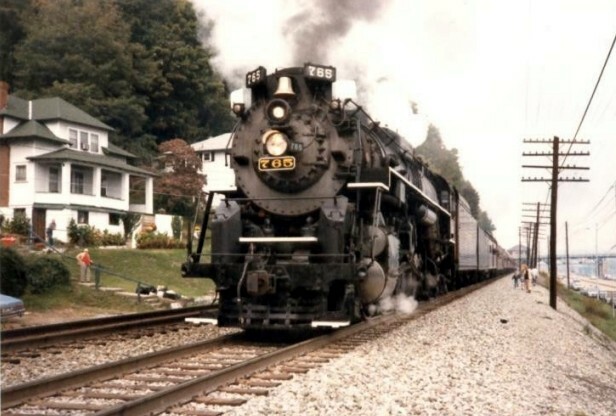 The times were changing in regards to steam powered excursion trains on Class I railroads. Insurance rates rose and regulations became more stringent in regards to safety and liability concerns. 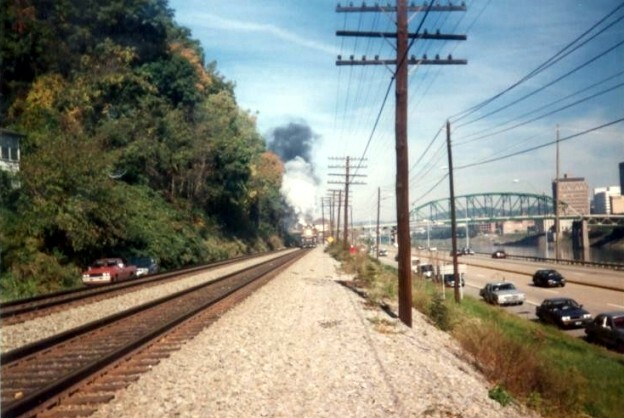 As a result, both CSX and Norfolk Southern ended steam powered excursions in 1994. 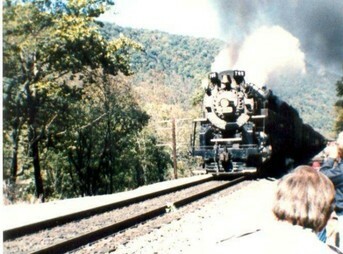 The final steam powered run on the New River Train was by Milwaukee Road #261 of that same year. For the past two decades, only Amtrak power has been used for the train. Although the annual train continues as a success, a bit of charisma has been lost. If one is a rail buff or historian, the ride is missing the nostalgic element that was so prevalent in the past. 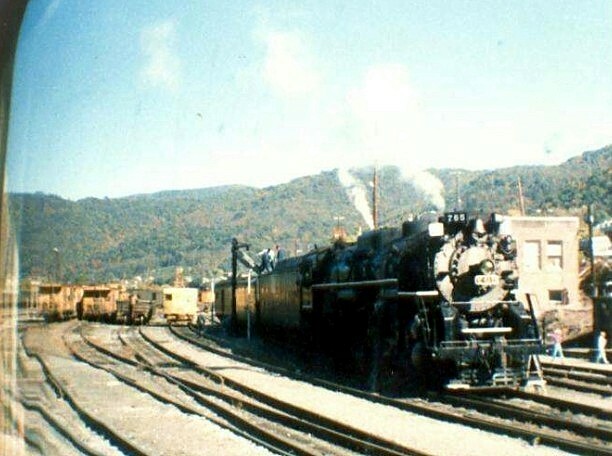 In 2006, the overhaul on the NKP #765 was completed and the locomotive began its second career in excursion service. 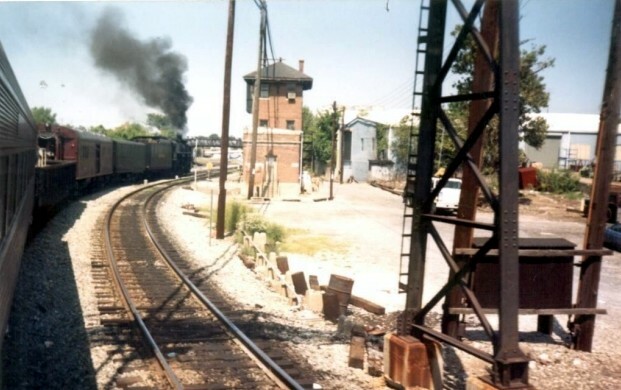 The greatest boost was the announcement by Norfolk Southern that it would revive its steam program after twenty years of dormancy. 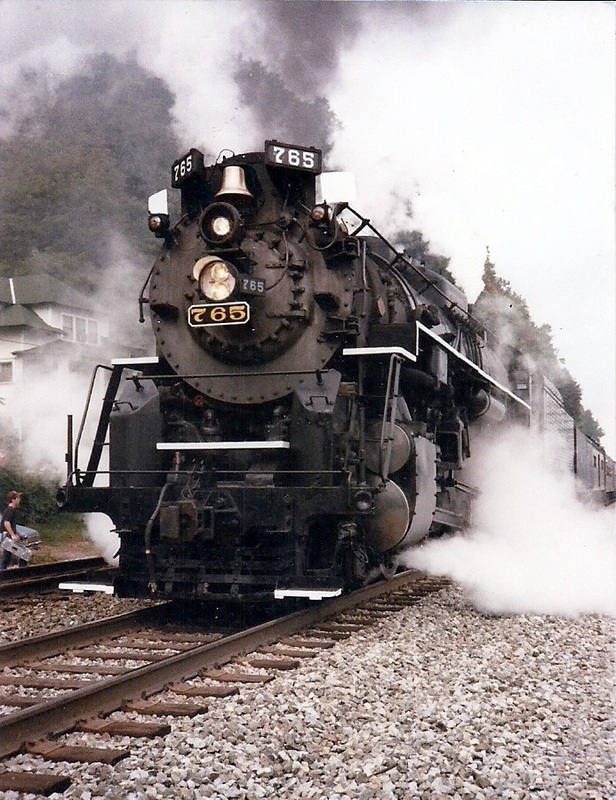 The #765 was used for employee excursions in 2012 and 2013 and will be a participating “member” of the company 21st Century Steam Program. 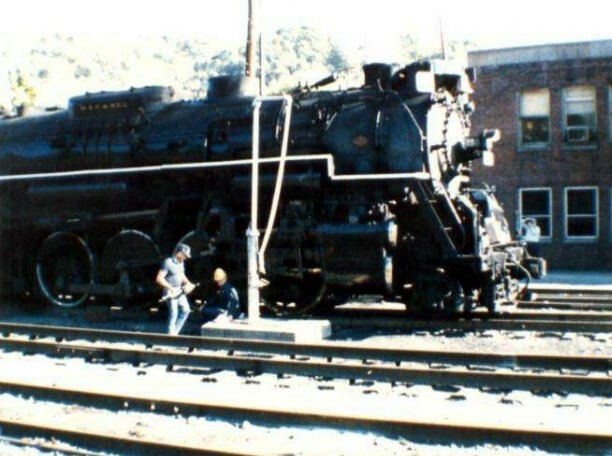 This revival is popular among the rail enthusiast and historical communities and best of all, introduces the steam locomotive to generations young and older that had not experienced the thrill of seeing them in service. The #765---in addition to other locomotives---will not disappoint. 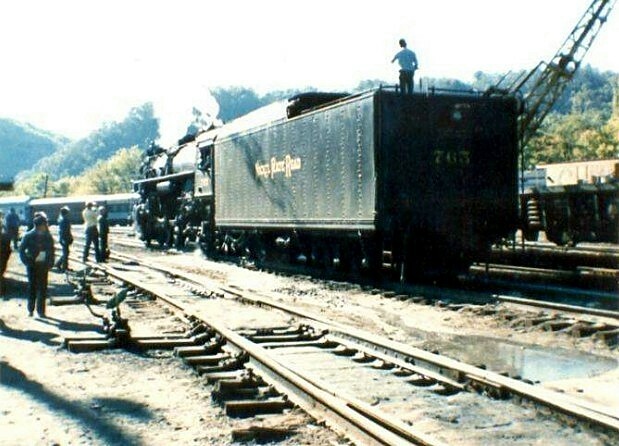 Unfortunately, the outlook is bleak in regards to the #765---or any other steam locomotive---powering the New River Train once again. CSX is not a participant---nor to date has not expressed an interest--- for a steam program in the foreseeable future. 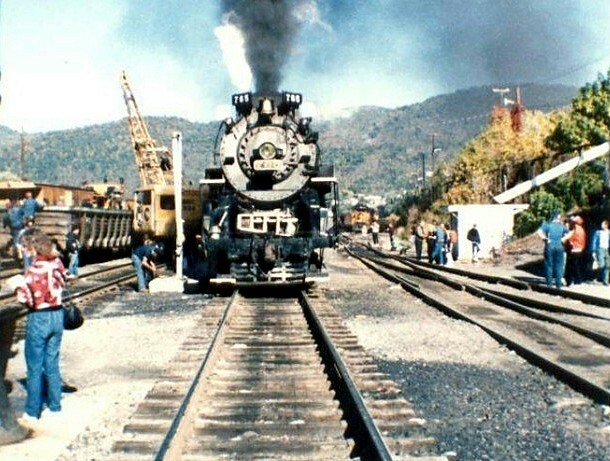 Unless a change of philosophy occurs in Jacksonville, steam powered locomotives on trains will not be how tomorrow’s excursions move. 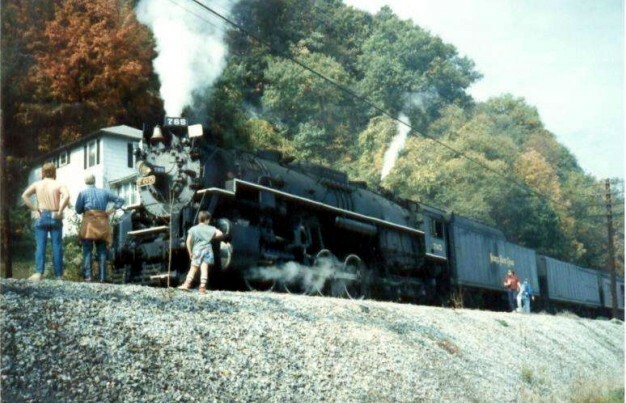 How wonderful it would be to see steam run again through the beauty of the New River Gorge amidst the vivid foliage. 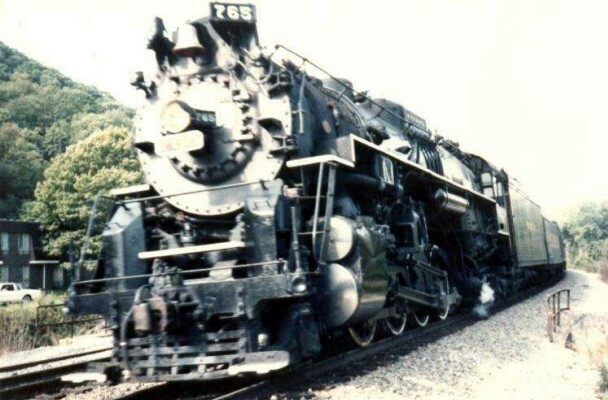 As of this date, I have not seen the NKP #765 since 1993 and hope for the opportunity in the near future as the 21st Century Steam Programs expands. Plenty of high quality photographs have been taken of the #765 and can be easily located on the web.